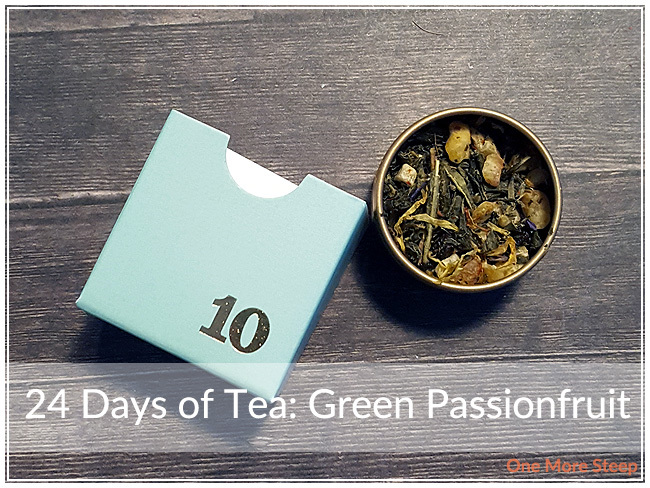 It’s Day 10 of the 24 Days of Tea advent calendar (only 14 more days left!) and the day of the tea is Green Passionfruit, which is a flavoured green tea. It’s not a tea that I’ve ever really paid attention to before, even though I’ve probably sampled it a good handful of times in store before. Green Passionfruit has this fantastic fruity smell to it, at first I couldn’t place it until I looked down at the tin and small the pieces of pineapple staring back at me. This mix smells sweet, which I attribute to the pineapple in the mix. The green tea leaves are visible, so are the corn flower petals. The dried black currants almost blend in with everything else, with their colouring, but they are very present in the tea blend as well. The ingredients of Green Passionfruit are: pineapple, green tea, black currants, cornflower petals, calendula petals, safflowers, natural passionfruit flavouring. I’m a bit disappointed that one of the ingredients isn’t dried passionfruit, to be perfectly honestly. DavidsTea’s recommendations for steeping Green Passionfruit is with hot water (75-80°C/167-176°F) for 3-5 minutes. I steeped my cup for 4 minutes. 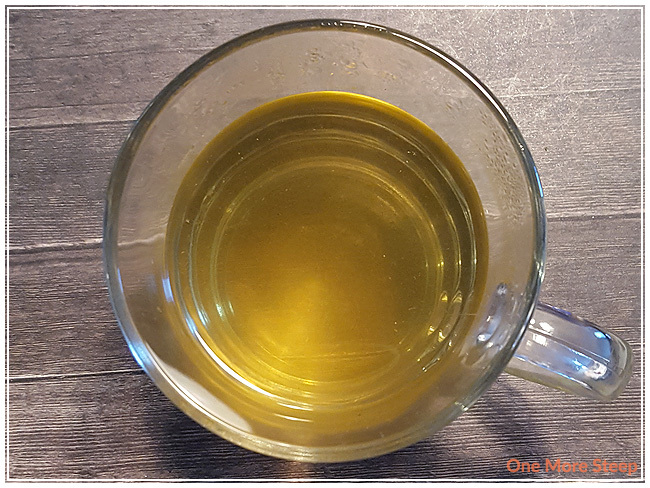 Green Passionfruit steeps to a fairly bright yellow – which I think has something to do with the pineapple, possibly a little bit of the green tea, and the safflower. This tea has a very sweet smell to it, the pineapple helps make it seem like a nice hot tropical drink. The green tea base isn’t completely masked by the fruit, as I can still make out the mild vegetal flavours of the tea. The pineapple and passionfruit play nicely together and don’t overwhelm each other when they balance out with the green tea. There’s a good amount of sweet to this tea, so I don’t think additional sweetener is necessary (at all!). I think this tea would be excellent iced, due to the fruity flavours and fruit sugar content. This is part of the reason that I find it a bit odd that it’s in a winter advent calendar – the tea itself is good, it’s just not really a “winter” tea for me. I tried one more steep of Green Passionfruit and found to the flavour to be very lacking. The fruity goodness of the first steep was nothing more than a memory with the second steep, and the sweetness had definitely waned as well. I think that Green Passionfruit is really only good for one steep. 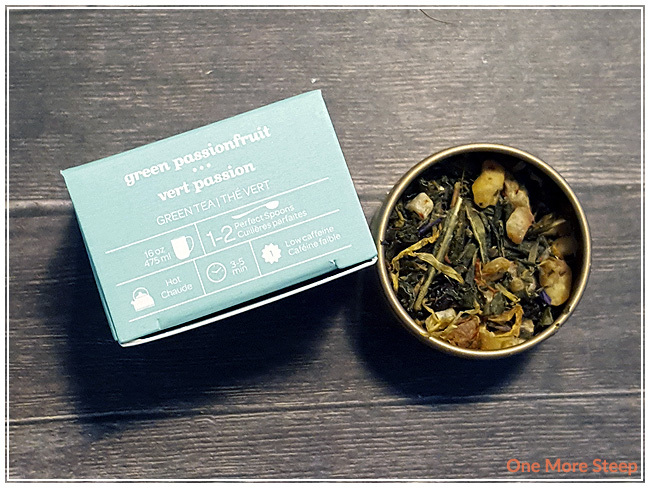 I liked DavidsTea’s Green Passionfruit. It has great fruity sweetness to it, and I think I would really enjoy this as an iced tea or cold steeped tea even more than I do hot steeping it. I find it to be an interesting choice for a winter advent calendar selection, since it would probably be better suited for an iced tea collection if it hasn’t already been in one. 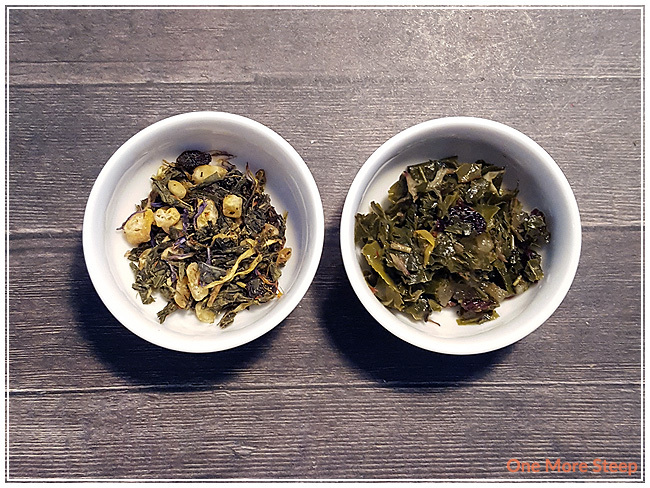 I enjoyed being able to taste the green tea base and there is a beautiful balance between the fruit flavours and the tea base, which I know from tasting experience can be difficult to achieve.